Rowley's best friend Greg Heffley has been chronicling his middle-school years in thirteen Diary of a Wimpy Kid journals . . . and counting. But it's finally time for readers to hear directly from Rowley in a journal of his own. In Diary of an Awesome Friendly Kid, Rowley writes about his experiences and agrees to play the role of biographer for Greg along the way. (After all, one day Greg will be rich and famous, and everyone will want to know his life's story.) But Rowley is a poor choice for the job, and his "biography" of Greg is a hilarious mess. 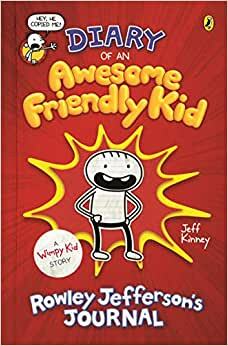 Diary of an Awesome Friendly Kid- Rowley Jefferson's Journal offers readers a new way to look at the Wimpy world-one fans won't want to miss! 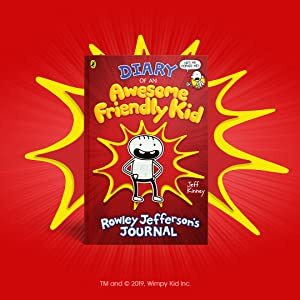 Start reading Diary of an Awesome Friendly Kid: Rowley Jefferson's Journal on your Kindle in under a minute. Get ready for a whole new look into Jeff Kinney's Diary of a Wimpy Kid! Introducing the newest Wimpy Kid author-Rowley Jefferson! 5.0 out of 5 starsAMAZING OMG!!!!!!!! i think that this was probably one of the best books ive ever read by jeff kinney!!! also i saw number 14 is coming out soon and i cant wait. jeff kinney is magnificent! My son doesn't love reading, but we got this book yesterday and he will finish it today. He is 9. Loves Jeff Kinney! He read for an hour before bed last night and woke up and got dressed and started reading again and then read on the short car ride on the way to school and when I dropped him off, he ran over to the crossing guard to show her too. He was very excited to get this book. I just wish that Jeff Kinney would write about 100 more books so that my son will continue to love reading! Before this book he was re-reading his Diary of a Wimpy Kid series! 5.0 out of 5 starsCan't wait for the next book. Rowley is seriously clueless. He believes greg all the time, and even if greg is clearly cheating off him Rowley does not figure it out. Greg is probably the funniest part. You see greg in a whole different view. Sometimes it makes me happy that greg is not my friend. Anyways great book. This book is more unusual than the others. 5 stars. 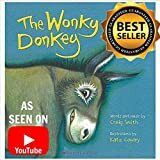 A very good book but if you're used to Greg's way of writing it may feel weird reading this one because he makes a 6th grade character talk kiddish. but still a good read! and I pre-order his books! !